That is hard to spell!! Silhouettes are all over blogland these days and cute projects abound. I love how they showcase cute little round faces and I'm thinking of staging a photography shoot with Logan to get a good one of him. I love that the ones below are non-traditional with some cute patterns thrown in. I will use any excuse to buy cute fabric/paper! jones design company has a great tutorial for making your silhouette on Photoshop! 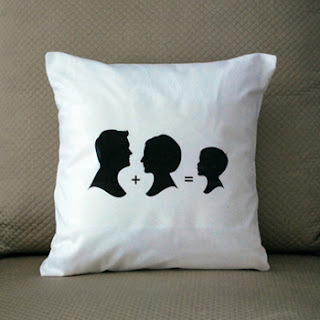 She also linked to this cool pillow that you can order from le papier studio. I'm thinking it needs a little pattern, but I like the idea! Simply Modern Mom has a tutorial for making some beautiful art with your silhouettes. Her instructions are for those more comfortable with paper and scissors. What do you think of these more modern versions of the classic silhouette?